Sign up! Sing out! Join our Community Chorus! A huge thank you to everyone who turned up for one (or all!) 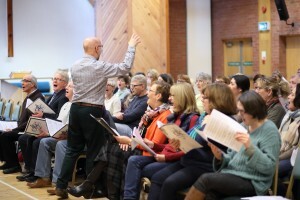 of our taster workshops for The Belfast Opera Community Chorus over the winter. Now, with spring finally here, we’re ready to move into the next phase of creating our 120-member chorus to sing in the World Premiere of The Belfast Opera. We’ll give you more details of the commitment involved at these workshops, but in short, rehearsals will take place every Tuesday and Thursday evening between 7:30pm and 9:30pm from April 5th. We recognise that things happen so will be asking that chorus members commit to attending 75% of rehearsals, and we may change some of these to weekend rehearsals as the process moves forward. The performances of The Belfast Opera will take place on Saturday 18th and Sunday 19th June, so we will need you to be available for rehearsals most evenings of the weeks of June 6th and June 13th. Some late afternoon calls may be required during the last week as we prepare for the performances. We’re excited that so many of you want to be a part of The Belfast Opera. If, for any reason, you are unable to attend one of the sign up workshops, but still want to be a part of the chorus, then you can still be involved: simply email me at [email protected] to let me know and I’ll add you to the chorus list. Thank you again for all of the passion that you have shown for The Belfast Opera and for being a part of creating a piece of our city’s story! And don’t forget to keep spreading the word to anyone and everyone about the chorus opportunity!